Profile by Vicki Stittleburg: Rose-breasted Grosbeaks are stocky, medium-sized songbirds with very large conical bills. The breeding plumage of adult males is striking; they have a black hood and back, a bright red chevron that extends from the black throat down the middle of the breast, and the underparts and rump are white. 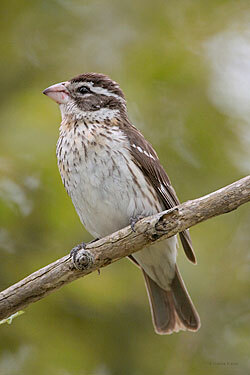 Females and immatures have brown upperparts, buff underparts with dark brown streaking, a thin whitish crown stripe and a bold whitish eyebrow. 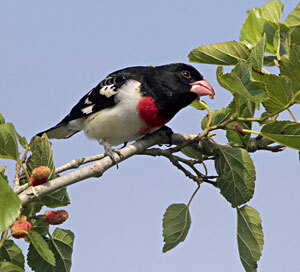 Arriving from winter homes in southern Mexico, Central America and northern South America, Rose-breasted Grosbeaks are currently moving through the Houston area on their journey to their northern breeding grounds. The birds are stopping to rest and feed on seeds, fruits and insects. They can often be observed gorging on any Mulberry Tree they can find. They will also readily visit backyard feeders and consume sunflower seeds with abandon. The song of the Rose-breasted Grosbeak is similar to that of the American Robin, but it resounds with sweeter, clearer, fluted tones. A couple of early twentieth-century naturalists said it is “so entrancingly beautiful that words cannot describe it".